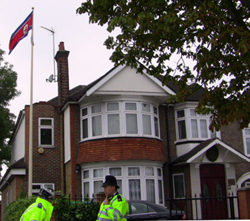 Dire financial straits at the North Korean Embassy in London seem to have played a major role in the defection of its No. 2 diplomat Thae Yong-ho. The Daily Telegraph on Saturday reported that the embassy, which sits in a semi-detached house in the drab western suburb of Ealing, owes 200,000 pounds in back parking fines. That boils down to 100,000 pounds for each of the embassy's two cars. The newspaper also said North Korean diplomats tried to make extra cash by buying used goods at flea markets. One staffer bought old dolls, cleaned them and sold them on.